Autumn is one of the great seasons; watching the color of the leaves turn, the brisk crisp coolness in the air and the emergence of pumpkins and squash in the market. 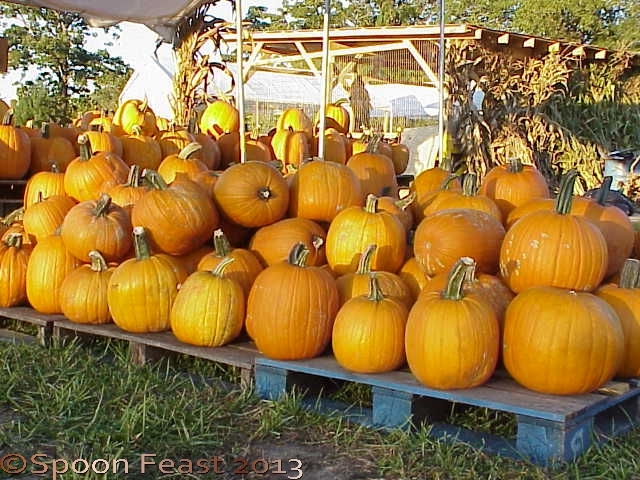 Today I saw these mini pumpkins and some white pie pumpkins, so I filled my basket. 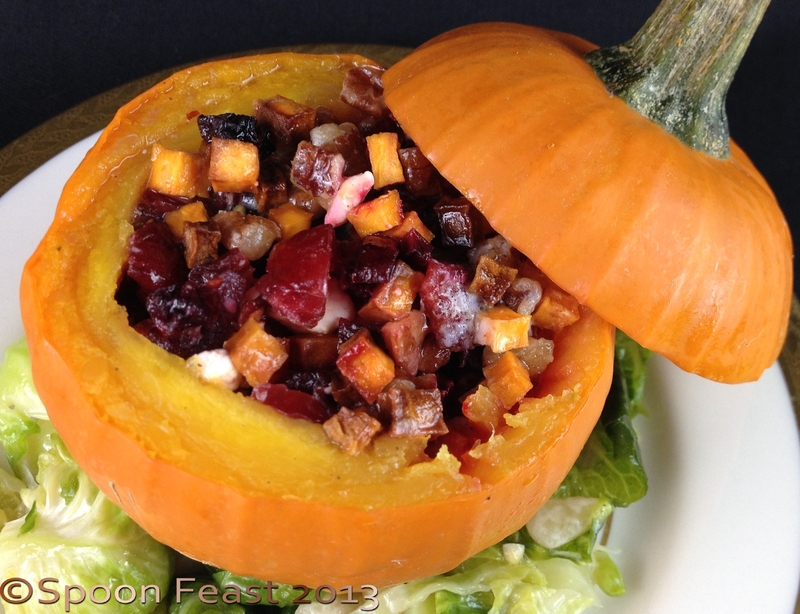 This stuffed mini pumpkin makes a great little side dish. The best part is you can fill it with a variety of things, from soup to salad or use it to hold grains or a mix of things like I did here. When using a variety of things inside the pumpkin, remember to cut them small so you can get a bit of everything in one bite. I think these would make a really pretty side dish on Thanksgiving table or buffet. To present them on a platter, think ‘patch patch’ and decorate around the pumpkins with salad greens or Brussels sprouts. To prepare the pumpkins, cut the tops off using a sharp knife. Then gently scoop out the insides and discard. Season the pumpkins inside with salt and pepper and a small bit of fresh butter. Steam the pumpkins until the inside flesh is tender. Test by using a fork or tip of a paring knife. Do not poke through the shell to test doneness, that would cause the pumpkin to leak any liquids you put inside. Once the flesh is done, place the pumpkins upside down on a clean towel and allow them to drain for a few minutes. Carefully fill each pumpkin with the filling. If serving warm, cover each pumpkin with tin foil and put it in an oven set at 400°F for 30 minutes or until the contents are warm. If serving the pumpkins cool or at room temperature, chill before filling. The filling used for these pumpkins is a filling that reflects the changes of the season. Keeping the vegetables separate as you cut them, roast them for about 10 minutes in a 350°F oven or until each cube is done through. Chop the toasted nuts and dried cranberries then combine them in a bowl, add the beets and potatoes as they finish roasting. Mix together and sprinkle in the feta cheese. Adjust seasonings with salt and pepper. A touch in cinnamon or ginger is a very nice addition and fragrant too. Either cool the mixture to serve cold or warm the mixture then stuff the pumpkins. Cover with the pumpkin “lid”, wrap in foil and warm in the oven. Use spatulas to lift the cooked pumpkins because the skin gets delicate and tears easily. Combine all ingredients except the oil in a large bowl, whisk together. Add the oil and whisk to combine. 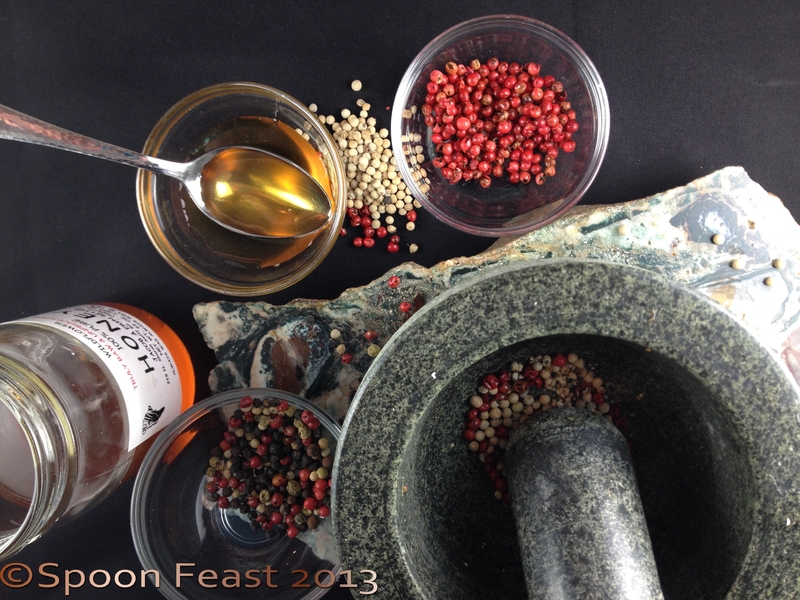 Adjust seasonings, stir or shake just before serving. 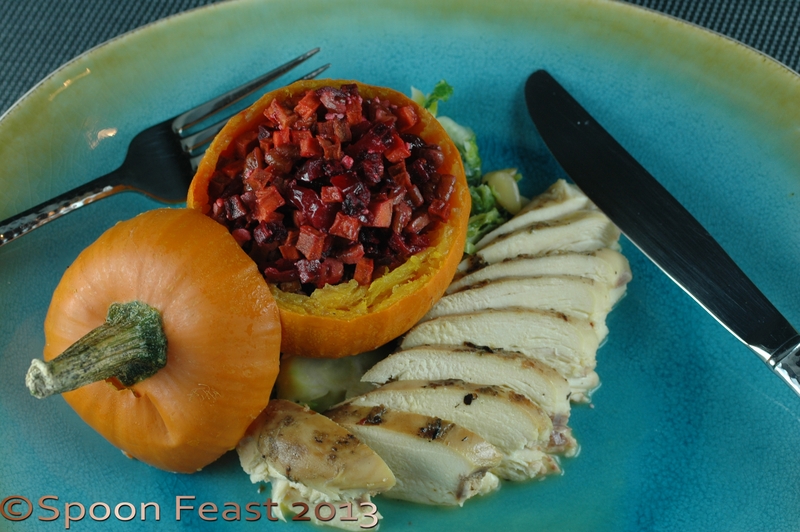 Top the stuffed pumpkins with a bit of Honey Peppercorn Vinaigrette just before serving and add a bit to the stuffing for added moisture. I hope you try making these stuffed mini pumpkins this season. 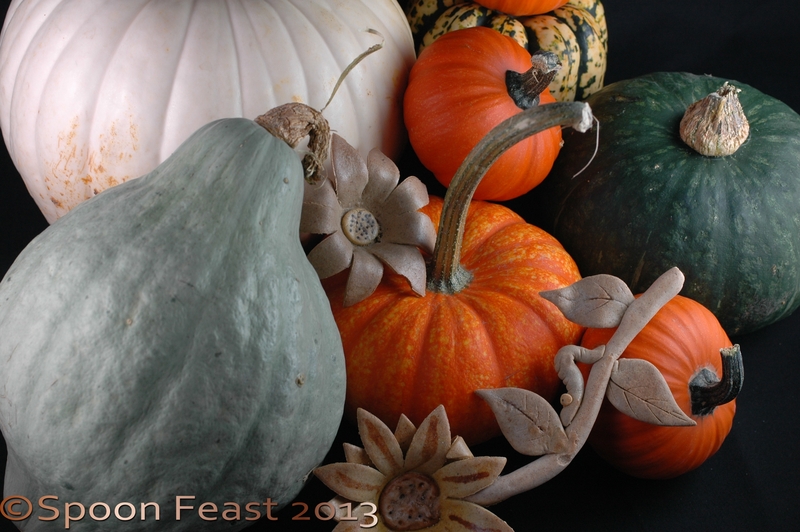 Personally I love squashes of all kinds and look forward to this time of year. 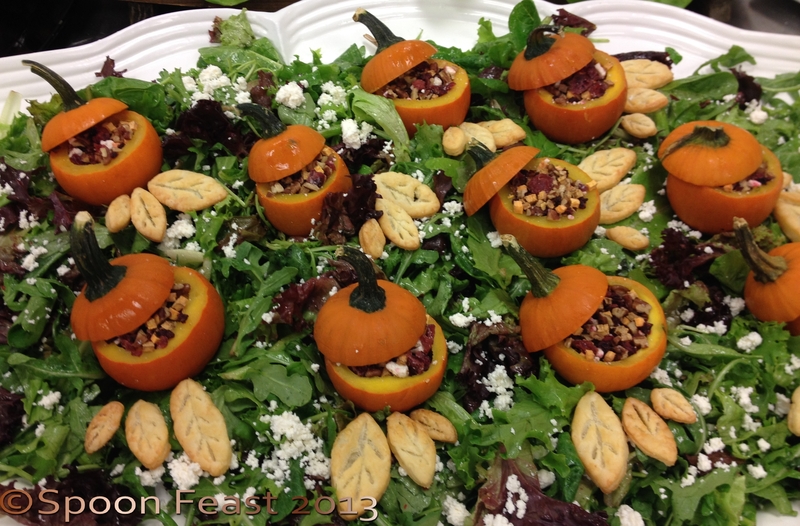 This entry was posted in Cooking, Recipes, Side Dishes and Salads, Southern Cooking and tagged Black pepper, mini pumpkins, pie pumpkins, Pumpkin, Roasting, Sweet Potato, Vinaigrette. Bookmark the permalink.